I am the Senior ANP for Haematology at the Churchill Hospital in Oxford. I specialise in Myeloid patients (AML, MDS, MPN etc). Within our Haematology Specialist Nursing Team we are all responsible for different conditions, so we are lucky to have Lymphoma, CLL, Myeloma, and Transplant nurses working within the service. We all bring different skills and personalities to the team, which makes it a very supportive environment to work in. 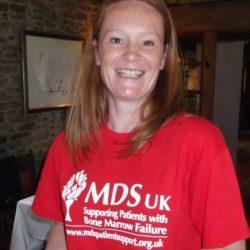 My clinical work involves helping to manage the myeloid patients, both on and off treatment. Roughly 50% of my time is spent making telephone calls to a large population of chronic patients and monitoring their bloods and altering treatment where necessary. The rest of my clinical time is seeing patients either on the Ward, Day Unit or Out Patients who are newly diagnosed, currently under going treatment or finished treatment. Being in this role allows for service developments, which enables us to adapt things to help meet the need of the patients under our care, and hopefully improve the service and care that we deliver. I also have a managerial role which entails looking after the Haematology Specialist Nursing team at the Churchill.